Hi, I’d like to thank Aquarium Advice and everyone within Aquarium Advice for all the help and support over the years. This tank wouldn’t be where it is today without people donating their time on answering questions and I’m really grateful. For me the attractions of aquarium keeping have been the restful nature of watching the fish tank world go by, the challenge of always something new, occasionally breeding fish and having fish come up to greet you (or at least greet the food container). It’s a pleasure being part of a larger community of hobbyists and professionals. I grew up in Eastern Australia and was introduced to the aquarium hobby by a friend who kept turtles. My first fish tank was goldfish with the occasional library book to provide some insights as back in the 1990’s there was no internet. Through secondary school and then university, my tank population exploded to cover cold-water, planted tropical communities, native fish and crayfish along with the (almost) obligatory betta. Air-pumps were almost as numerous as internal, under gravel and HOB filters were all air-driven. I then shifted to Western Australia for my first serious job, married, started a family and owned a hobby farm for a decade. About 5 years ago I decided to get a really large tank. 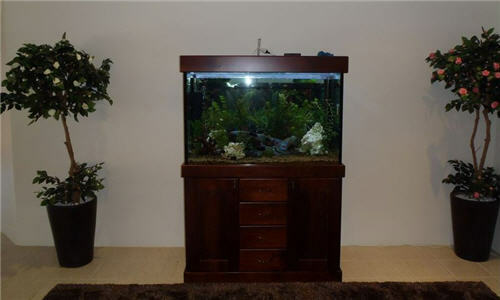 The intention was that this would be a display tank so we selected a nice, shallow 3 foot tank with a varnished wood stand to match the furniture. The local fish shop couldn’t have been more helpful and with discounts I actually ended up buying a tank which was 4 ft by 2 ft by 2.5 ft high. 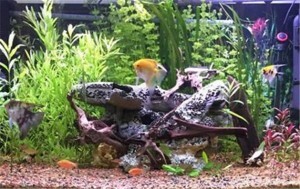 Of course now I bemoan that I didn’t get one much bigger again but at the time this tank looked absolutely huge. A little old guy that looked around 60 carried one end, while two of us carted the other end inside. Below is one of the first pictures, for reference the top of the tank is about 6ft high. Set-up: Now adays the aquarium setup has expanded but in the main it’s a fairly standard approach. I change about 30% of the water each week while the canister filters tend to get cleaned on long weekends. 2 x canister filters (in cabinets under tank). 1 x internal mechanical filter / power-head. 1 x internal UV unit (separate to filters). 2 x heaters and 1 x air pump. 1 x 4ft quad T5HO light (with 2 small underwater lights being trialed for plant growth). 1 x CO2 bottle with solenoid / controller (ISTA), ph probe, co2 diffuser and a spare co2 bottle. 1 x Sen-eye Reef monitor. (I mainly have this for the par meter for light measurement). 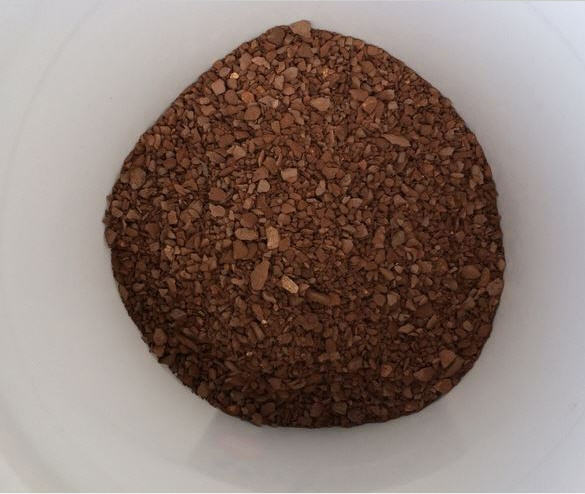 The substrate is a mixture of fine gravel, seachem fluorite (red) and a planted tank substrate pellet (hideously expensive). I’d like to do away with the gravel completely at some stage but the plants do grow as it is with the help of substrate fertilizer tabs. Lights come on in the morning and night for a split photo period of 7 to 8 hours in total. CO2 injection is of similar time length, except the CO2 injection starts an hour before the lights come on. 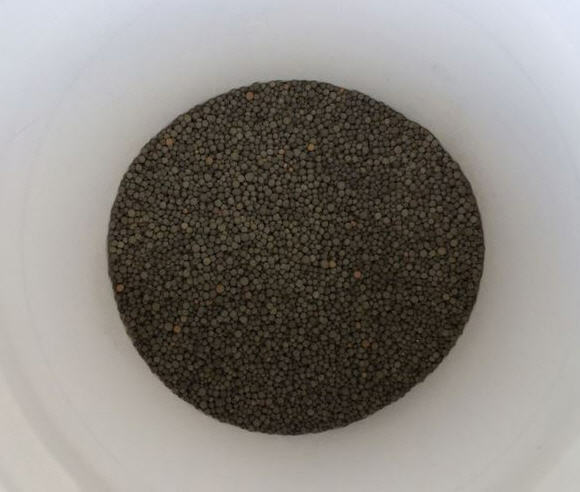 The plants are fertilized with a mix of substrate tabs and dry fertilizers. Potassium is overdosed while nitrates and phosphates are lean dosed. Generally, I’ll test water chemistry once a fortnight, mainly for nitrate, phosphate or kh. The ph controller is set to turn off the co2 injection at ph of around 6.6 but in practice I find this is more of a fail-safe. I think this reflects the large volume of the tank. CO2 is injected to the tunz diffuser which sits under the internal filter. The filter then acts as a power-head to push water around the tank. 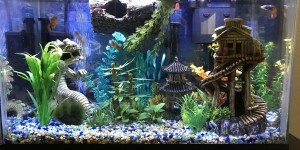 Fish Mainly my preference has been for tropical planted, community tanks. 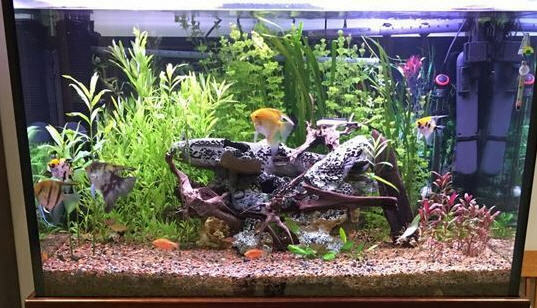 I like to have several schools of fish with a few larger center piece fish for display. However, I really enjoy everything from cold-water to saltwater. 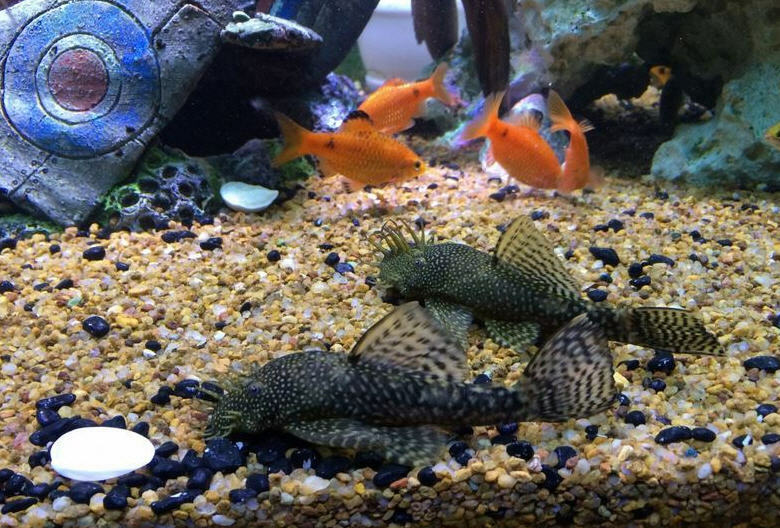 Bristle nose catfish (3 males and 3 female). 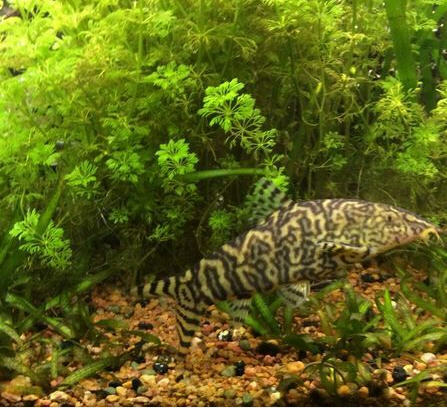 1 bumblebee catfish (bought at local auction and is very shy!). Ornaments: About 6 months ago I redid the scape in the tank to improve water flow and access. The top of the tank is at head height so it was just about getting to the stage of sending a diver down to work around all the ornaments scattered in the tank. Now I have centralized these so that a sunken plane sits on three large fake rocks with caves. Driftwood has been inserted around the base of the plane to break up the lines. Surprisingly all the catfish and loaches seem to get on very well, with only a few squabbles at feeding time. Plants: I’m fortunate that many of the staff at the local fish shops are also keen aquarium keepers. Large, deep fish tanks seem to generally get groans of dismay when asking around however. 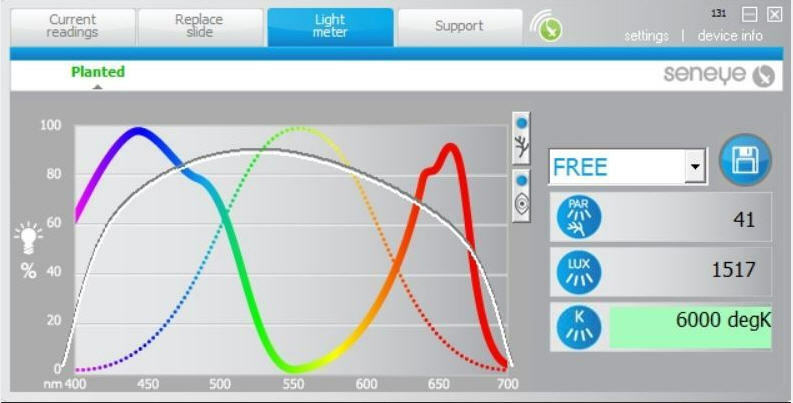 The use of good LED or T5HO lighting and CO2 injection is often suggested (albeit expensive to undertake). For this tank the use of CO2, dry ferts and moderate light has resulted in far better growth, (with less algae), than I was achieving before. Plants are still a work in progress. I’m always happy if anything grows however have improved to grow better plants and less algae. I have entered below what I believe are the plant names. Sometimes the stores don’t always have labelled plants and I’ve gone through quite a few pots to find plants that will grow well in this tank. Melon Swords and Java Ferns. The future Originally the tank was bought for cichlids and I may still do that at some stage. Sometime in the future I’d really like to delve into the saltwater side as well. This is what I love about the hobby, the possibilities are endless. 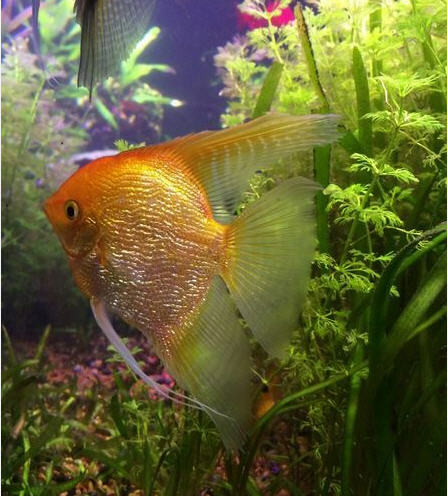 Filed under Featured, Freshwater, TOTM.